Are you wondering what to do with all your Hasegawa/Airfix Hurricane Mk I's? Well wonder no longer, because Aviaeology's new sheet on the subject solves that problem for you. Vital Storm part 2 is a follow-up to the previously reviewed Vital Storm part 1. 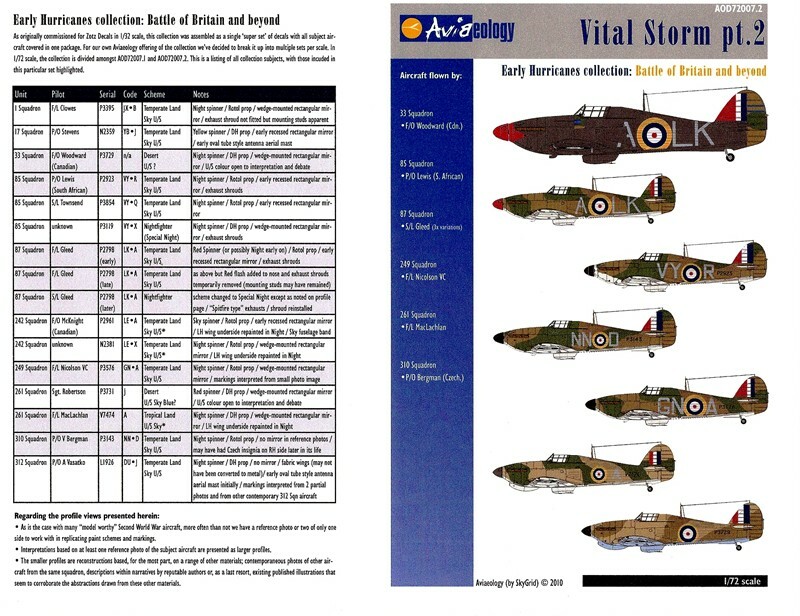 Aviaeology provides well researched decals on eight subjects including three alone for Ian Gleed's mounts. Each subject is complete with narratives on time period and painting suggestions. The instructions and diagrams are provided on three photo copied sheets, but an email request to Aviaelogy will get you a promptly sent color PDF of the instructions which will prove helpful. I especially appreciate the listing of books and accessories that could further aid the modeler in his quest to build the perfect Hurricane. Listed below is a breakdown of the subjects. 87 squadron, F/L "Widge" Gleed; June/July 1940. Standard B scheme. 87 squadron, F/L "Widge" Gleed; August/October 1940. Standard B scheme. With addition of red nose scallop. 87 squadron, F/L "Widge" Gleed; April 1941. Black overall except for camo rudder. 33 squadron, F/O "Woodie" Woodward (RCAF); October 1940, Egypt; Standard A scheme (desert). 261 squadron, F/L JAF MacLachlan; November 1940 Malta, Standard B scheme (tropical-spinach and sand). 310 squadron, P/O V Bergmann (Czech); October 1940, Standard A scheme. 85 squadron, P/O AG Lewis (S. Africa); July 1940, Standard B scheme. 249 squadron, F/L JB Nicolson (VC); August 1940, Standard A scheme. Aviaeology's review sample is in perfect registry and the colors are vivid. 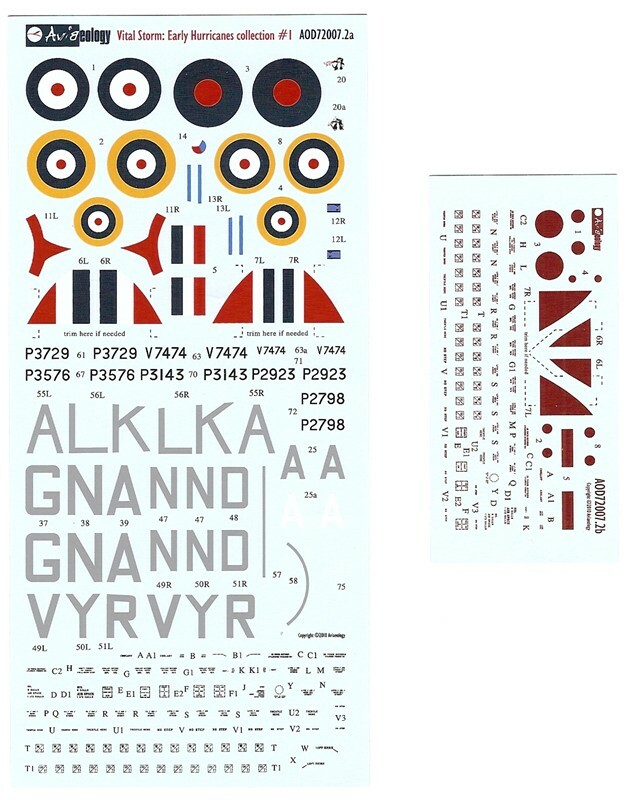 You also get an extra sheet with dull red stencils, dull red meetballs and fin flashes. I have not used them yet, but I have other Aviaeology sheets in my collection that are consistent in quality to the sample. I plan on doing Gleed's all black with red scallop and camo rudder, next would be the spinach and sand Malta bird, followed by the desert hurricane based in Egypt. From what I've heard and read the Aviaeology decals bed down nicely and work well with the Micro Set/Sol system. Highly recommended. Now where are my Hurricanes? Thanks to Aviaeology/SkyGrid and to IPMS/USA for the opportunity to review this sample.